UNITED STATES – Lockheed Martin has signed a letter of intent with UK-based Straightline Aviation for the sale of 12 of its new Hybrid Airships, a deal worth US$480 million. Delivery is scheduled to begin in 2018 and continue until 2021. The Hybrid Airship promises safe and affordable delivery of personnel and cargo to the remotest locations. 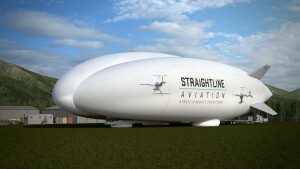 Straightline plans to charter the airships with crew and maintenance contracts to potential customers in Canada’s north, Alaska, southeast Asia, and the Middle East. Already there is talk that Alberta’s oil sands producers are interested. Any remote mining project, whether in the Arctic, Africa or Australia, could benefit from the new technology. Combining the abilities of a helicopter (vertical takeoff and landing), cargo plane (20-tonne capacity with of a maximum speed of 110 km/h), and hydrofoil (touchdown on land or water), it promises to be a boon to projects in remote areas. Using the Hybrid Airship offers multiple venues for saving – no more expensive infrastructure such as roads, ice roads and long landing strips. The environmental footprint is much reduced, especially the carbon footprint. For the complete list of advantages or information on buying a Hybrid Airship, go to www.HybridHE.com.